What to Wear: Road Trip! Looking forward to a weekend getaway with the barkada? We planned some cool outfits for you! The sweet smell of summer is in the air! It’s time to round up your friends, get in the car, and go on that epic road trip you’ve always dreamed of. 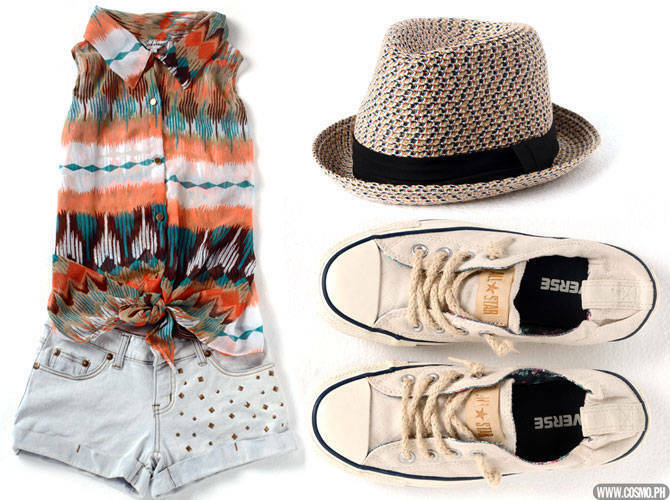 We picked out three outfits that are sure to keep you cool and comfy during long hours on the road. In an air con-blasted car, trade in the studded denim vest for a colored cardigan to provide extra warmth. Don’t forget to wear a cami or bandeau underneath this ultra-sheer tank. If you aren’t digging the tri-colored shorts, try a solid-hued bottom, maybe in mint. Not ready to bare it all with short shorts? Try a flowy maxi skirt to maintain the no-fuss vibe of this outfit.